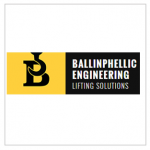 Ballinphellic Engineering is one of the leading providers of overhead cranes in the Munster region. Their high end pharma clients have maintained their relationship through the years and it can be attributed to Ballinphellic Engineering providing a long-lasting, trustworthy service. Their new workshop in Crossbarry, ensures that Ballinphellic will continue to be a major player in the Muster region. Their customers include some of the biggest names in the pharmaceutical, construction,water treatment and manufacturing industries. They have diligently meet their customers every need regarding lifting solutions of over the past 30 years. Sitecert has a solution to our inspection administration problem- and it works. We can also see how the new features will benefit our customers, as they become more information hungry regarding products they use.